Something I had noticed in Philly, & many other cities. 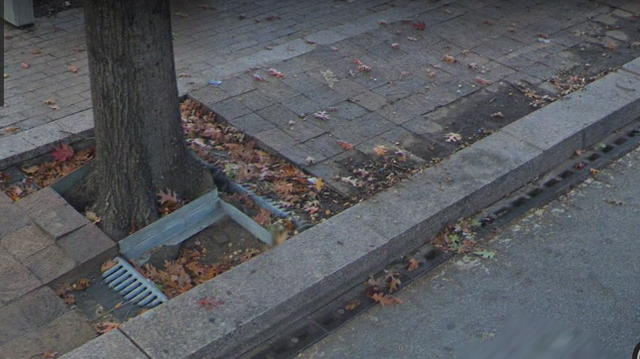 Do they use granite or marble for curbs? Its funny to think that cities get all the fancy designs. What the hell are you talking about? Curbs are usually made of concrete. Curbs are usually made of concrete. Depends on the area/region. Many roads in Massachusetts indeed use granite curbing. Although not too common anymore but here's an example of bituminous/asphalt curbing. Huh. Learn something new every day! Stone curbing is much more durable than concrete and can be more cost-effective over the design life of a project, especially in areas with frequent snowplowing or when heavy trucks frequently mount the curb. Granite is the most common, but you'll also see sandstone, bluestone, and slate. NYCDOT is unique in using steel-faced curbing for almost all applications, and it's also much more durable than concrete. Granite is available in quarries all over the country, and it is very hard. VDOT typically uses granite for aggregate in asphalt pavement and in concrete. Marble is expensive and is soft, so I doubt that would be used. ^ Probably moreso a case where there isn't a lot of granite or marble across the Central U.S. And the Upper Midwest in particular makes considerable use of concrete, even on local streets and county roads. Ok, so those of us who have driven in cities; the example in my discussion will be Philadelphia. Would “Sensor” signals instead of “Timed” signals in cities reduce traffic? I’ve noticed that Philly POS is sometimes at Level F. Especially during rush hour. With that being said, I have noticed is that many traffic lights just change because of the “Timing” setting & there will usually be no traffic at the other light & we all know how long certain traffic lights take to change back to green. It’s a waste of time & allows traffic to build up at the red light which causes people to run the light when it changes. Also all of the “No turn on red signs” cause a huge traffic problem because it delays right turns, I understand it slows traffic down aswell, but the amount of cars that get to turn on busy streets with heavy walking traffic is terrible. 2-3 cars per green light, maybe 2 more if they run the red light. I understand they have the NTOR because people like to hesitate on turns & it causes accidents. But they some how have to make it work between the amount of walking traffic & driving traffic. That is my question. See you all below . I’ve noticed that Philly POS is sometimes at Level F.
methinks you mean "LOS" - POS is something entirely different. Also all of the “No turn on red signs” cause a huge traffic problem because it delays right turns, I understand it slows traffic down aswell, but the amount of cars that get to turn on busy streets with heavy walking traffic is terrible. the heavy ped traffic tends to justify this - remember, there's people trying to cross the street you're turning from when you have a red light. permitting people to turn on red often leads to cars blocking the sidewalks as a driver attempting to turn edges out, trying to get a better view of traffic. i think there are some intersections that could benefit from permitting right turn on red (or left on red in the case of some one-way intersections), but if there's no money available for local studies i'd be inclined to err on the side of safety and leave the default of no right on red. Granite is pretty unavailable due to local geology from Ohio west to eastern Colorado. Around here, northern Illinois, if the curb is old (like 1900-1920), it may be made of dolomite. Modern concrete curbs (and all concrete here) are made with dolomite aggregate. Dolomite is limestone which is very soft and makes very poor aggregate for asphalt or concrete, it quickly wears and the pavement troughs out. I have driven around northern Illinois enough that I can tell that they are not using limestone for aggregate in pavement. Dolomite is a bit different than limestone (magnesium instead of calcium), and I can guarantee you it is indeed used for aggregate for concrete here, having quarried it and mixed it into concrete myself. DC has some spiffier-looking curbs on some of the roads around the Mall. I don’t know what they’re made of, but when they installed them I recall it initially seemed odd not to have a curb apron. Limestone is a carbonate sedimentary rock that is often composed of the skeletal fragments of marine organisms such as coral, foraminifera, and molluscs. Its major materials are the minerals calcite and aragonite, which are different crystal forms of calcium carbonate (CaCO3). A closely related rock is dolostone, which contains a high percentage of the mineral dolomite, CaMg(CO3)2. For various concrete applications it would not matter if the aggregate was soft. How about for concrete pavement? Maine DOT uses stone for their curbs, granite, if I recall correctly. Signals using detectors & actuation settings ("sensors") generally are better than fixed-time signals for many applications. If the network is fully saturated, there's not an appreciable difference between semi-acutated and timed signals, because the full saturation of vehicles will run signal phases to the max (and the effect might as well be fixed time). However, if the network is reasonably but not saturated, a semi-actuated system with coordination to adjacent signals can be more beneficial. This allows some pre-set minimum green times for all phases, but can extend or omit phases based on demand--the specific timing of green indications for certain phases along a corridor ("offset") allows for green waves to happen. However, if you've got an evenly-spaced street grid and simple phasing (no left turns, for example), fixed-time can actually work quite well. This is especially true if you've got alternating one way streets in the grid. I'll never forget downtown Portland, OR--their downtown one-way grid keeps traffic moving pretty steadily at around 20mph without delay (and if you're walking against the traffic flow at an average pace, you'll nearly always hit the walk signal as well). It's worth noting that if there not traffic coming in one direction and the light changes, it's not necessarily a fixed-time signal. Sometimes, the controller could have a phase set to minimum or maximum recall--this forces the signal to run a green for either the minimum or maximum green time associated with the phase in the settings. Also, if the detector for a particular phase is malfunctioning (e.g. the loop is accidentally cut), many controllers will default to a max recall for the detector's associated phase. If you see a signal change over for no traffic often, it might be worth mentioning to the local agency to check on. Sorry, I didnt see this comment till now. I know that they can control the signals at times when it’s needed, but as many of us know cities in this example Philly uses Time signals, & I know this because of lack of the lines on the ground that are usually used for weighted signals, unless they use something else, but there are no cameras above the signals either so they are outdated & probably wont be updated anytime soon because of costs. Also I don’t know the data of the traffic in Philly, but I do know that if a certain number of cars cannot get through the light in a certain about of time it’s LOS-F. In Philly’s case its LOS-Z. There can be problems with sensors. Those embedded in the pavement can be crushed by heavy trucks and remain permanently actuated until fixed. (This was a surprisingly frequent problem when I lived in St Louis.) They also may not detect light vehicles, especially motorcycles. Cameras are better and almost always detect bikes, but can be knocked off their lane alignments. They can also fail for other reasons. Lights with set timing usually don't need as much maintenance. And here's the uses of aggregates from the Illinois Association of Aggregate Producers. Dolomite is indeed used in pavements. So, let's try this again, shall we? NE Illinois uses quite a bit of dolomite for building its roads. It doesn't say that it is used in concrete pavement, and it doesn't say that it is used in the surface course of asphalt pavement. So you're doubting the actual industry in the state? Do you do this regularly with experts? So you're doubting the actual industry in the state? Do you do this regularly with experts everyone? FTFY. And the answer seems to be yes, if history is a judge.